People from "hill" towns really seem to be cursed – first Silent Hill, now White Hill. While the former is well known to many, the latter is entirely new but now open to visitors in Red Mount Media's newly-released side-scroller, Ellen. The game's namesake is the Smith family daughter, the only one not found when the entire family was "brutally murdered" years ago. Now, however, the townsfolk are "getting uneasy as more and more witnesses have spoken about seeing the silhouette of a little girl standing in the house." Could this somehow be the missing Ellen? A year after the sightings begin, a "bright and eager investigator" named James arrives to investigate and "finally reveal the truth of what happened that horrible night." If he survives, that is. 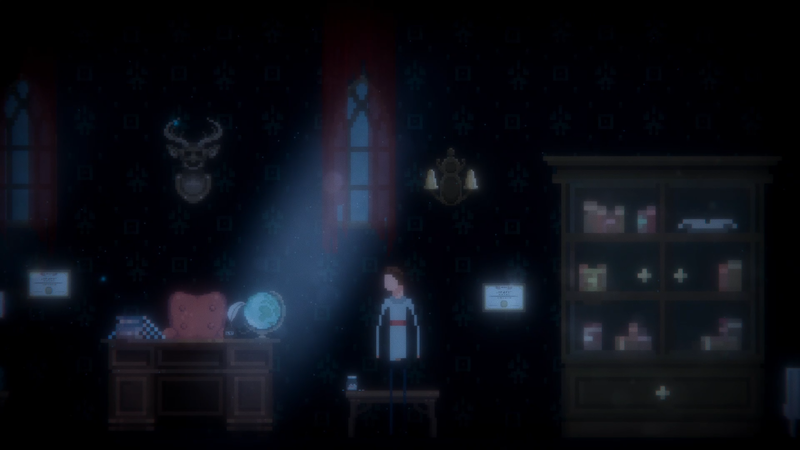 Following in the footsteps of other retro-styled supernatural thrillers like The Last Door, Ellen is presented in rudimentary pixel art but steeped in atmospheric darkness (and in this case, often literal darkness as well). Using a keyboard or gamepad, players will explore the "unnerving residence" and its surroundings, all while "solving puzzles and persisting through nerve-wracking scenarios" along the way. Contributing to the "emotional and thrilling experience" promised will be some run-like-hell moments, along with some stealth and basic self-defense when confronted by terrors seeking to seal your fate. Not only is the complete game available now on Game Jolt for PC, those who'd like a sample taster first can download the playable demo from the same page for Windows and Mac. To learn more about the game, be sure to check out the official website for additional details.